I don’t know what I like best about this little guy, but he is just too cute! I think it’s his little teeth that get me. This is a simple enough holiday card to make in bulk, with enough interest to keep me from getting bored. 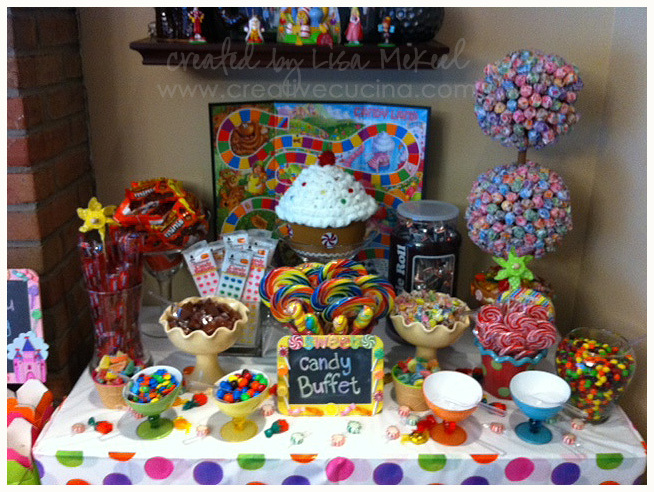 Each element can be prepped in advance and I can assemble them quickly if I plan ahead. 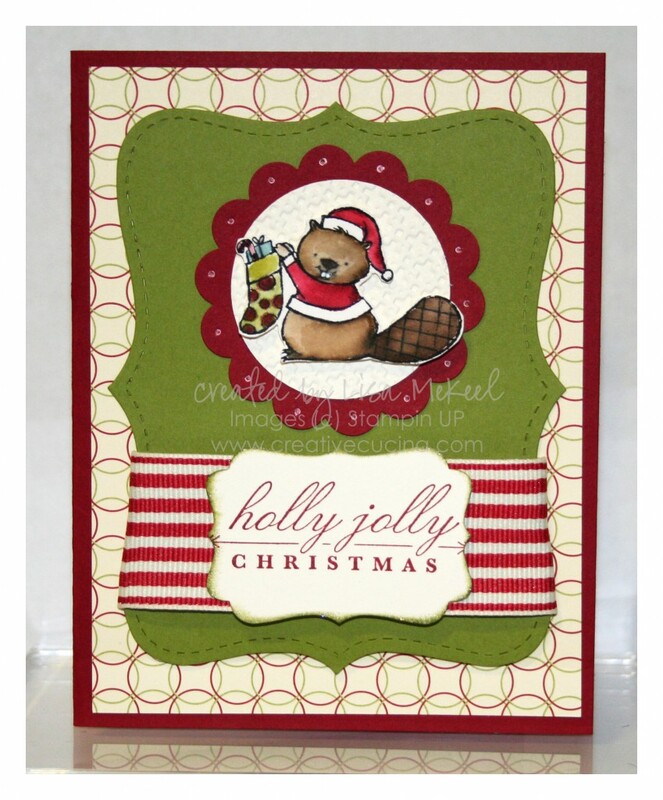 The card base is Cherry Cobbler, layered with Jolly Holiday DSP. I cut Old Olive card stock with the Top Note Die in the Big Shot, and wrapped some 1 1/4″ Riding Hood Red Striped Grosgrain Ribbon (from the clearance rack) around the front. Next, I stamped the sentiment from Bright Christmas (Holiday Mini) in Cherry Cobbler ink on Very Vanilla card stock, punched out with the Decorative Label Punch. I sponged some Old Olive Craft ink around the edges, sprinkled on some Iridescent Ice Embossing Powder, and heated it to give a glittery effect without the glitter. 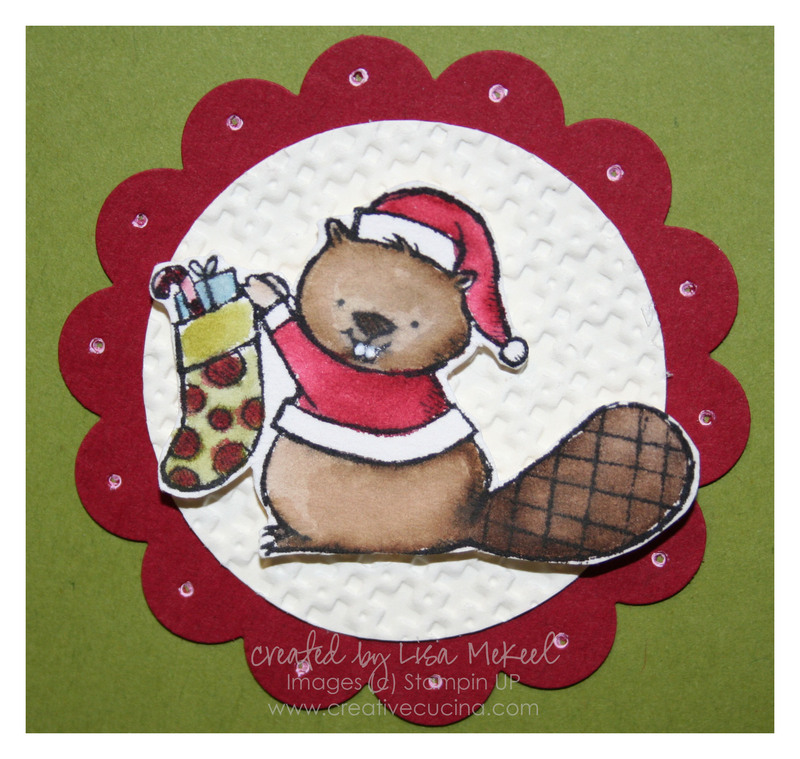 For the main image, I stamped this adorable little beaver from Merry Crittermas onto Watercolor Paper with Black Stazon ink and colored it in using SU Markers and the Aquapainter.I use this technique for easy watercoloring. To make his teeth extra white, I used the Signo White Gel Pen. 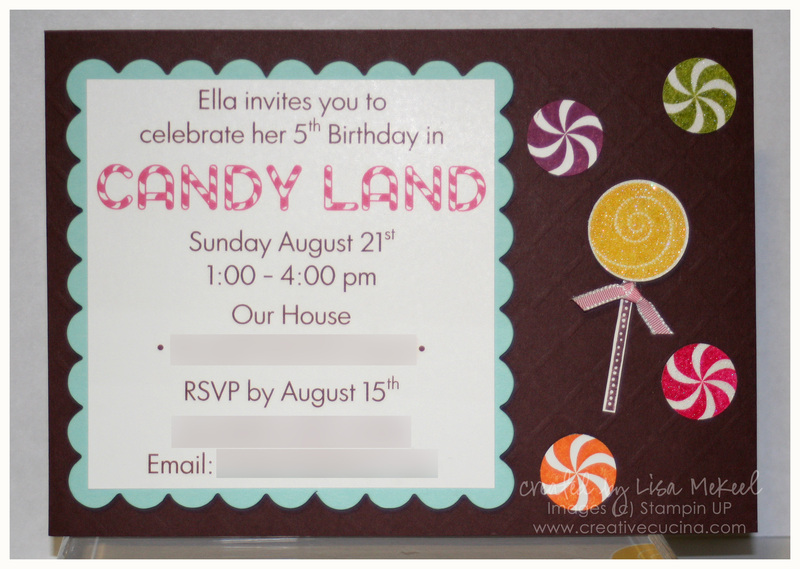 Then, I trimmed the image out and attached it with stampin’ dimensionals to a Very Vanilla 1 3/4″ Circle that I embossed with the Square Lattice Embossing Folder and Big Shot. That is layered onto a Cherry Cobbler 2 3/8″ Scallop Circle, dotted with the Signo White Gel Pen and Paper Piercer. This would make a nice holiday card; the wintry scene is just so peaceful. I love Branch Out for fall/autumn applications but I wanted to try my hand at using it in a different way. The card base is 4 1/4″ x 11″ baja breeze, layered with a 4″ x 5 1/4″ Night of Navy panel. On the front, I stamped a 3 3/4″ x 5″ piece of baja breeze card stock with the tree from Branch Out in Basic Gray ink. 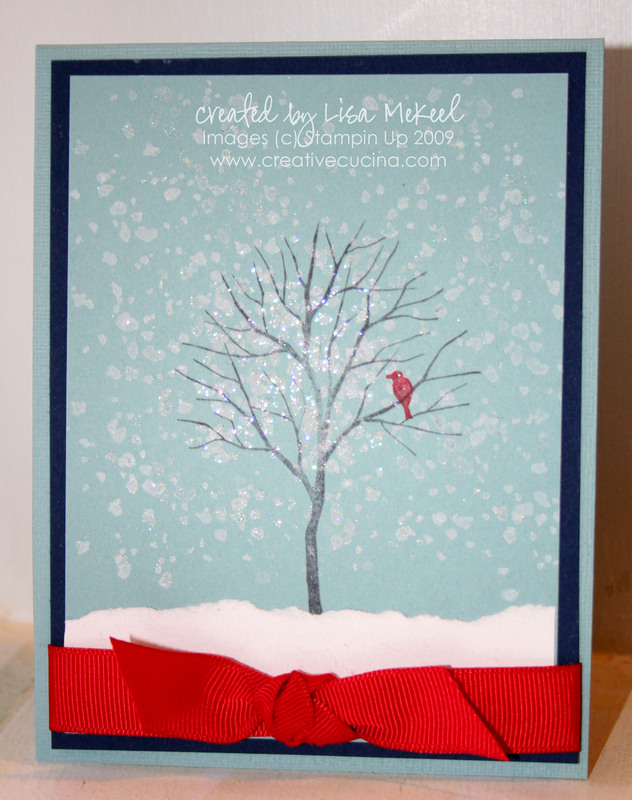 Then, using the “leaves” stamp from the set, and White Craft Ink, I added snow all over the tree and surrounding areas. The bird was stamped in real red ink. To give the snow some more sparkle, I sprinkled Iridescent Ice Embossing Powder on the wet craft ink and heat embossed it. Along the bottom, I tore a strip of Whisper White card stock to create a snowy ground cover. Although not visible in the photo, I used my Glue Pad to add a thin layer of White Flock to the strip of Whisper White to give a fluffy snow effect. Finally, I tied some Real Red 5/8″ Grosgrain Ribbon around the bottom and adhered the Night of Navy and Baja Breeze layers to the card base.